This is an LDR based Emergency Lamp that turns on a High watt White LED when there is darkness in the room. It can be used as a simple emergency lamp in the child’s room to avoid the panic situation in the event a sudden power failure.It gives ample light in the room. 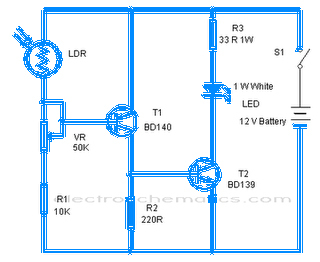 The circuit is too simple so that it can be enclosed in a small box. A 12 volt miniature battery is used to power the circuit. 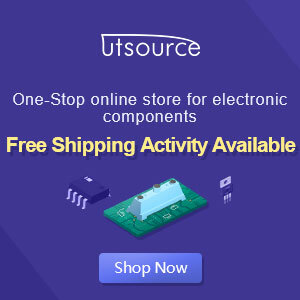 Two transistors T1 and T2 are used as electronic switches to turn on / off the white LED. When there is sufficient light in the room, LDR conducts so that the base of the PNP transistor T1becomes high and it remains off. T2 also remains off since its base is grounded. In this state, White LED remains off. When the light falling on the LDR decreases, it cease to conduct and T1 forward bias providing base current to T2. It then turns on and White LED switches on. White LED used in the circuit is 1 watt High bright Luxeon LED . Since 1 watt White LED consumes around 300 milli ampere current, it is better to switch off the lamp after few minutes to conserve battery power.